In an ever more competitive global economy, having a website is an important piece of your marketing strategy. This is especially true if you are a small business, because you simply cant compete with the advertising budgets of bigger, more established businesses. The internet helps level the playing field. If your content is compelling and catches the attention of viewers, its ranking will rise, leading to more viewers and potential customers. Unfortunately, many small business owners make rookie mistakes that turn their websites into weapons of self-destruction. A major trap for businesses setting up their site is to fall for all the fancy extras offered by DIY website builders and designers. All these things just confuse people viewing your page. The UI of your site needs to be as user-friendly as possible. Have a brief home page that explains your company, a contact page, and pages to clearly describe your products or services. If youre doing an e-commerce site, make sure that product pages and the check out pages are organized and easy to navigate. If the check out process is simple, it makes it easier for customers to buy your merchandise. This goes back to the rule of simplicity. Graphics can draw in viewers when used properly and in moderation. Too many simply make it harder to load your page and make navigation of your website confusing and difficult. Use graphics like punctuation marks; sparingly and where emphasis is needed. Keep in mind a simple web page loads better on mobile devices. This is important as more and more people use their smartphones and tablets to access the internet. Getting to the front page of search results created an entirely new branch of marketing and advertising based on the perfect search engine formula. 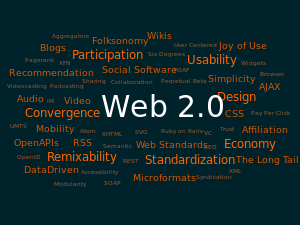 However, Web 2.0 changed the game. As major search engines like Google grew, they created more advanced search formulas that do more than see if web pages have the required number of keywords. They look at the quality of content and if people actually view your site. Good options for improving your ranking include ease of navigation and a blog that provides information about your company and its products. The secret to great marketing on the internet is to meet a need. Some marketing books call it finding pain. A customer who needs information on a problem, like replacing a car part on an older car, will look specifically for sites that have the relevant information. That is why its important to use your site to educate your customers about your products and how they meet their specific needs. Using blogs, FAQ pages, and product descriptions can help you do that. Dont be wordy. Clearly explain your services and products and what they can do. The customers who need you will do the rest. By following theses tips you’ll see more traffic come to your site. It also is important for companies building websites to learn from mistakes and experiment. Pay attention to metrics to see how different styles and content attract viewers.